Do a Google search and you are likely to see a map with businesses listed below it. 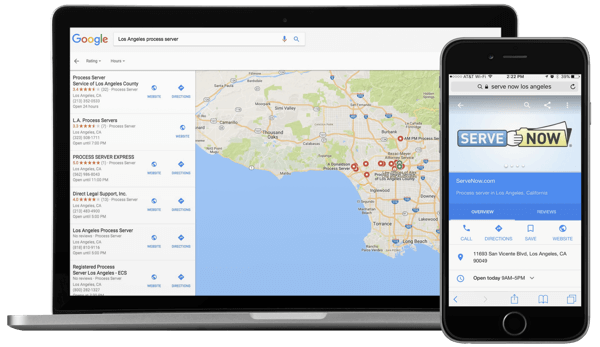 These results show local Google business profiles. You need to be found there for the keywords that describe your business. Our Local product gets you listed, optimized, and ranking! We submit your business to Google, Bing, Yelp, and many top-ranking local directories and web sites. These sites drive clients to your business and provide the necessary citations your business needs to rank well locally. Your local project starts with verifying and optimizing your local profiles. To maintain rankings, we continuously feed your data to the most visible online directories. Ask about our mobile-friendly websites and PInow listings. With an SEO optimized site and strong backlinks, you can rank multiple times in your service area!